So Hot Tin Roof has been funded on Kickstarter and is in need of a big push on greenlight to get onto Steam. 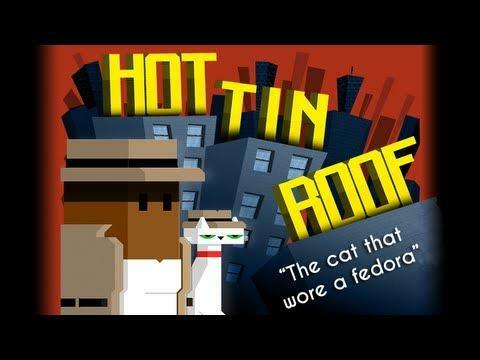 Quote Hot Tin Roof: The Cat That Wore A Fedora is a single-player game aimed at PC / Mac / Linux. It plays best with a gamepad, but works great on mouse and keyboard. On the one hand, it's a noir side-scrolling adventure platformer, stuffed with style and charm. You're Emma Jones - a two bit gal in an 8-bit world - and you're the Private Investigator on a string of grisly murders. You'll run, jump and climb through a massive 3D city (it's not just a flat sideways plane), sleuthing up clues and tracking down the killer. Our editor Muntdefems did a first look review of a build we got sent on it, it's worth a look. Well done to Megan for getting over the goal needed! Great news, I liked this game a lot.